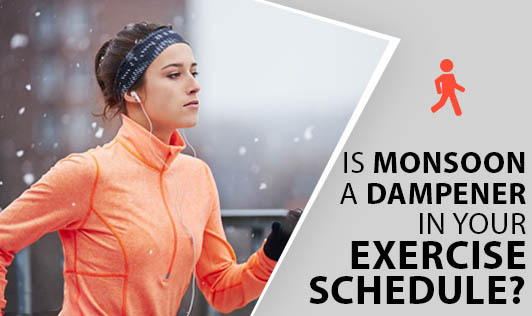 Is Monsoon A Dampener In Your Exercise Schedule? The weather outside may be rainy, dull and gloomy with the monsoon, but exercising indoors can be delightful. Don't let the rain deter you from a great workout or physical activity, even if you don't have exercise equipment. At your home or other locations, you can create many fun activities for kids and adults. TV Workouts: A number of television networks offer fitness programs. You can choose from traditional or step aerobic workout, belly dancing, yoga, and other formats. These programs usually have a host who explains the exercises, shows how to do them at beginner and advance levels, and with or without equipment. Station Training: Create a station of resistance workouts using dumbbells, or soda or milk bottles filled with water. Do curls, squats, lunges, rows and kickbacks. Add a cardio station, performing five or more minutes of jumping jacks, jump rope, and high knee skipping or jogging in place. Run hills using your stairs. Create a bodyweight station, with push-ups, sit-ups, chin-ups, pull-ups and chair dips. Goofing: Turn up the music and dance around the house. Movement is exercise. Tension Bands: These provide a versatile means for strength and endurance work, creating an excellent means of home exercise. You can work every muscle in your body with a single band. Bands come in a variety of strengths, making it easy to progress as your strength improves. Ball Exercise: Exercise balls are another useful tool for home exercise programs. They may be used for balance and proprioceptive training, core strengthening, and as a bench to perform your bench press on. Balls come in different sizes and will often include an entire workout program for you to follow. During rainy season get the most from your workouts by organizing and arranging an exercise space and a schedule that caters to your exercise tastes and needs. Get started!